During 2001/2, Porterbrook, a train leasing company, received two three-car (Nos.170397 and170398) and a two-car unit (No.170399) for spot hire to train operating companies from Bombardier (formerly Adtranz of Derby). Running numbers being 50397 to 50399 and 79397 to 79399 with the centre cars being Nos. 56397 & 56398. These units were taken on lease by Central Trains in 2004. Nos.170397 and 170398 went on lease to Cross Country Trains when the Central Trains franchise ceased in 2007. These units have similar mechanical characteristics to other sub-class 170s. In less than ideal conditions for photography three-car class 170 diesel multiple unit No.170397 in Cross Country Trains livery has charge of the 12:08 service from Nottingham to Cardiff (train code 1V09). It was photographed by Andrew Smith at Tibberton on the ex-Birmingham & Gloucester Railway line (avoiding Worcester). Photograph taken on 21st September 2012. 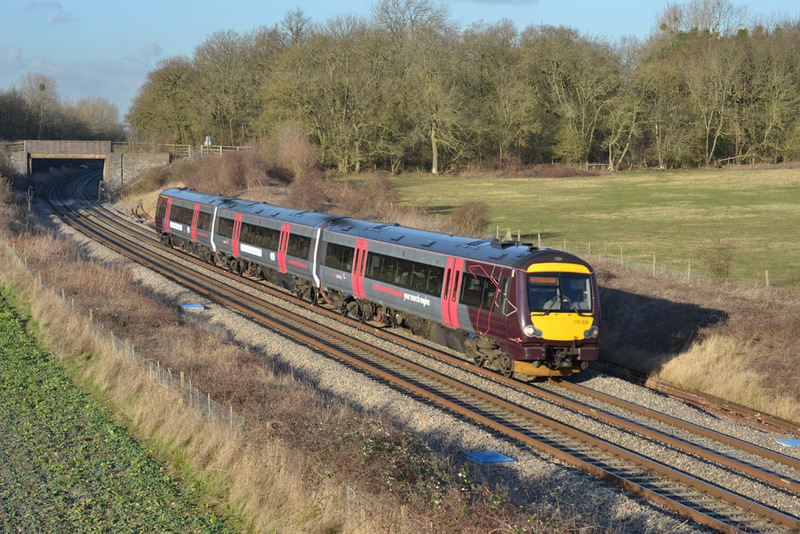 On 13th January 2012 class 170/3 three-car diesel multiple unit No.170398 was seen at Croome on the same working as No.170398 above but on a rather better day for photography. Photograph taken by Andrew Smith. A photograph of this unit in Central Trains/Porterbrook livery on 23rd August 2007 can be found on a Worcester Shrub Hill page. 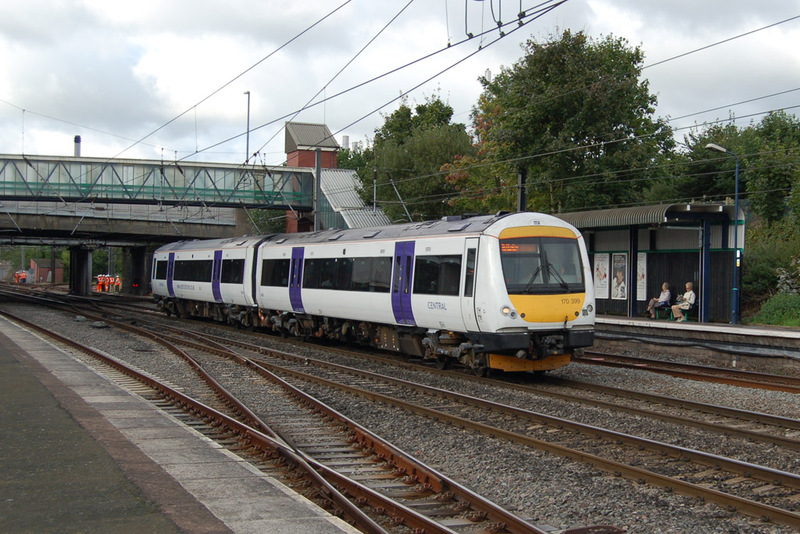 In Porterbrook's house livery but with Central Trains name and web site details on the side class 170/3 two car diesel multiple unit No.170399 (with No.50397) leading passes Longbridge Station on its way to Birmingham New Street on 7th September 2006. 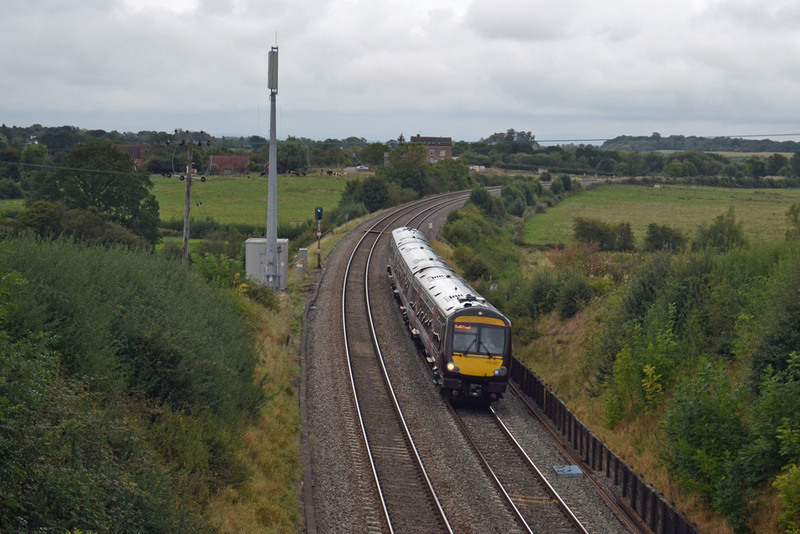 This unit was later returned off lease and subsequently renumbered to 170309 for First Trans Pennine services. Photograph by Andrew Smith.